Lee Harrer is a book collector and book dealer who was a founding member of the Florida Bibliophile Society and served as its President for two years, and for many years thereafter as Editor and Publisher of its Newsletter. 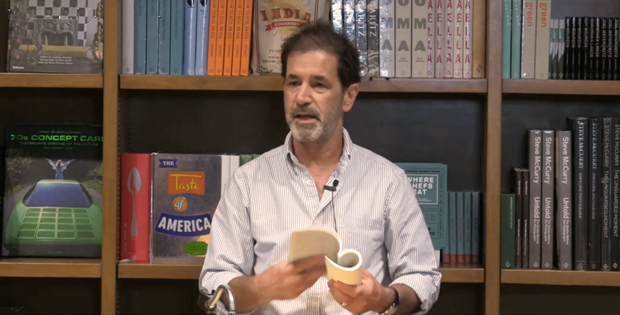 His donation of the Harrer Collection of Books about Books forms the heart of the Tampa Book Arts Studio Library Collections at the University of Tampa, and he continues to serve on the advisory board of the Tampa Book Arts Studio. 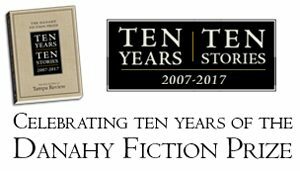 The print edition of Tampa Review 50 has a focus on Arts and Crafts that includes the revival of fine printing as a significant part of the Arts and Crafts Movement. It is an appropriate focus not only because we carry on this tradition today through the Tampa Book Arts Studio, but also because we are welcoming the new Museum of the American Arts and Crafts Movement currently being built in our community. It was with these connections in mind that we arranged a conversation with Lee Harrer, a man who has long been committed to the arts and crafts of bookmaking. We are in the Special Collections room of the library, surrounded by the Tampa Book Arts Studio Library Collections in the Macdonald-Kelce Library at the University of Tampa. Sean Donnelly and Richard Mathews are talking with Lee Harrer about his friendship with Charles F. Hamilton, one of the authors responsible for the contemporary appreciation of the work of Elbert Hubbard and the Roycrofters, a dedicated group of men and women inspired by Hubbard who joined him to establish an Arts and Crafts community in the 1890s in East Aurora, New York. Richard Mathews: How did you first meet Charles Hamilton? Harrer: Back in the late 1970s, I came across a fellow in Dunedin, Florida, who had a large collection of Roycroft material. In fact, I acquired the majority of my Roycroft publications from him, and most of them are now on the shelves here as part of the TBAS Library Collections. Not long after acquiring the Roycroft materials, I became aware of Charlie Hamilton as a member of the Dunedin Public Library Friends group, and I learned that he had written books about the Roycrofters (As Bees in Honey Drown: Elbert Hubbard and the Roycrofters, Little Journeys to the Homes of Roycrofters, Roycroft Collectibles, and Alice Hubbard: A Feminist Recalled.) Since I was just getting acquainted with the body of Roycroft publications, I called him. I just wanted to see if he could tell me anything that I didn’t know—which was a whole lot! Fairly early in their membership they gave us a very good program on Elbert Hubbard. They owned a lot of artifacts, because Virginia also had a strong interest and had been the curator of a museum dedicated to Elbert Hubbard in East Aurora. Charlie was very well informed because of the research he had done for his books. Together they had both been collecting, studying, and learning about Hubbard and the Roycrofters for many years. They lived in Dunedin, on Union Street, which is actually a division between Clearwater and Dunedin—the north side is Dunedin and the south side is Clearwater—and Charlie felt connected to both towns. But because he lived on the north side, he used the Dunedin library, and he was quite active with the library Friends, also—and with the Clearwater library as well. But I believe that the Dunedin public library depended on him quite a bit. He was a source of articles for their newsletter, and if I remember rightly, he contributed articles to the local weekly newspapers as well, on a variety of topics. 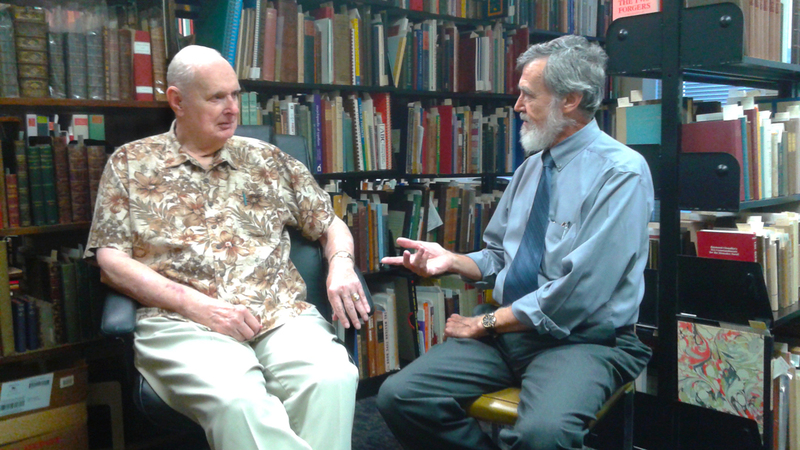 Lee Harrer talks with Richard Mathews in the Tampa Book Arts Studio Library Collections room. Mathews: Did he continue to collect work by Elbert Hubbard and the Roycrofters while he was living here? Or was he pretty much finished collecting when you knew him? Harrer: I think he had pretty much finished collecting when they moved here. He and Virginia had a lot of artifacts. For example, they had Hubbard’s cloak. You may recall seeing pictures of Hubbard—in what I call a “slouch hat” and wearing a cloak. They had that—or one of those cloaks, at least. Mathews: Whatever became of the outfit? Harrer: I don’t know. When Charlie died, I talked with Charlie II, his son, who had come down to help Charlie and was also living in the house in Dunedin at the time. He was closing out the estate, and some of the books here in the collection today came from that. Charlie II gave me that book, for instance (gesturing to a book by Hamilton) with other material that is up there. Mathews: What kind of a person was Charlie Senior? Harrer: He was just a very good person—personable and engaged. He obviously enjoyed talking about the Roycrofters and Elbert Hubbard. In fact, he enjoyed talking about anything. It made him a good person to get along with. 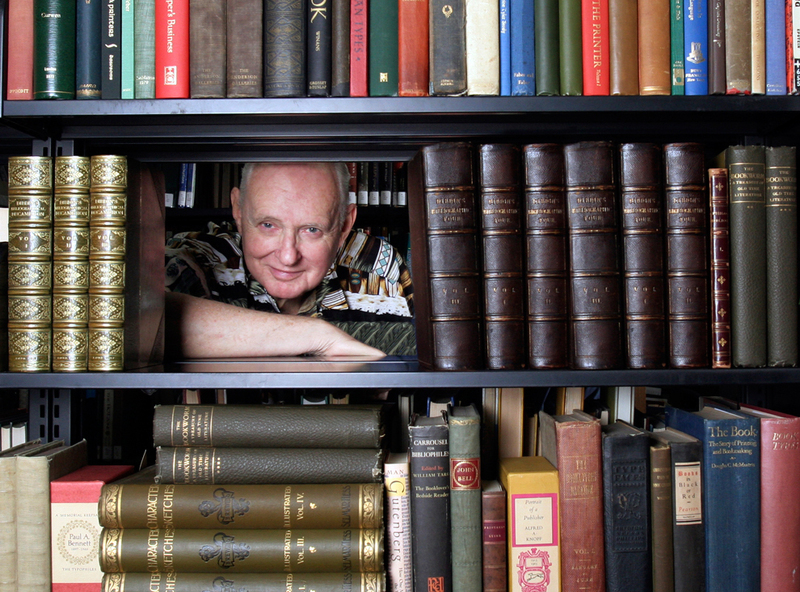 Mathews: Do you recall his participating in meetings of the Florida Bibliophiles? Harrer: He probably gave more than one program for us, but the one I remember most was out at a Holiday Inn where we were meeting in Pinellas County. This must have been back in the late 1980s. They brought a whole lot of stuff, including that memorable cloak I just mentioned. It was a good meeting and it made a strong impression. I mean, it’s hard to forget that cloak! I have looked in the past week or so for a box that has our early newsletters in it. I thought I could look up the report on Charlie’s program. Mathews: We have some of those early records in box files in the Book Arts Studio. They were part of the recent materials we acquired from Special Collections at the University of South Florida, and we thought it was interesting and appropriate that those Florida Bibliophiles materials could be housed here. Harrer: I spent a week in a vacation place in North Carolina about 1995. I took all the newsletters along with the idea that I was going to make a listing of president and officers, where the meetings were—that kind of detailed stuff. I spent a full week reading through from Volume I, no. 1, through the mid-1990s, put it in the three-ring binder, and now I can’t find the three-ring binder or the early issues. I wanted to find those issues to see what references had been made to Charlie and the Roycrofters. Mathews: We might have some of those in our files from USF Special Collections. That’s why Carl [Carl Mario Nudi, Letterpress Coordinator of the TBAS and former Florida Bibliophile Society officer] wants to put the rest of the FBS materials here. We could have pretty much complete files for the organization. We have the founding documents, your original charter, minutes from the early meetings, all the early newsletters. They are all organized by date, nicely arranged in folders. Harrer: I’d like to look at that. I should look at that. I have no idea how they would have gotten there, to USF, unless Jay Dobkin gave them to USF when he was head of Special Collections there. I know that I didn’t. I was the honcho from the time it died once, and I resurrected it. It might be material that they got from Jay or from Bill Scheuerle (USF professor and Bibliophile). Mathews: I think it’s from Jane Poston, another active Bibliophile. Wasn’t she working over at the USF library in Special Collections for a time? I think after she had the bug to complete a rare books library course, and she worked as a volunteer in Special Collections there. My theory is that the files came from her. Sean Donnelly: What’s the origin of your interest in the Roycrofters? Harrer: The crazy batch of material that I bought from the guy in Dunedin. It included issues of The Philistine and quite a few of the “Little Visits.” That box is around here, full of many of the “Little Visits” pamphlets that were virtually falling apart. For many years I told myself that I would find the time to restring them, sew them back together—the early ones were string-bound. They were done by hand, and some of the string had broken over the years. I thought it would be something I could master and just fix them up, but I never got to do it. Mathews: Good intentions . . .
Harrer: They should be here, I think. Mathews: I was telling Sean this morning, that I hadn’t realized what a strange character Hubbard was. He was a con-artist of sorts—a soap salesman who started a movement, self-consciously setting himself up as an inspirational figure. People began paying homage to him, quoting him all the time, partly because of his self-promotion. Meantime, he was a closet bigamist, with a second wife hidden away and carrying on with him. He doesn’t seem to had done much of an honorable thing for her. I wonder what kind of genuine admiration he would be held in by ordinary people, had they actually known him. Did Charles Hamilton appreciate him as a Bohemian figure? What did he find to admire in Hubbard? Harrer: I don’t think Charlie himself was what you would call a Bohemian. I think he was a good, down-to-earth American type. I get the impression that Charlie actually became interested because of his wife, Virginia, who was the curator of the museum. I think he became interested through her. And because he enjoyed writing and probably had an eye out for something that would be interesting material for him to write about. Hubbard was neglected, and he saw it as a good subject to look into. Donnelly: What was Hamilton’s own background, career-wise? Harrer: He was in public relations. So that put him in a good position also to help organize the Roycrofters At Large Association, which worked to preserve the Roycroft Campus in East Aurora. One of the founders of the RALA was Nancy Hubbard, Elbert’s granddaughter. Mathews: I believe you told me that he also met Elbert Hubbard the second. Harrer: Yes. There are some letters here in the collection which indicate they had been in contact. 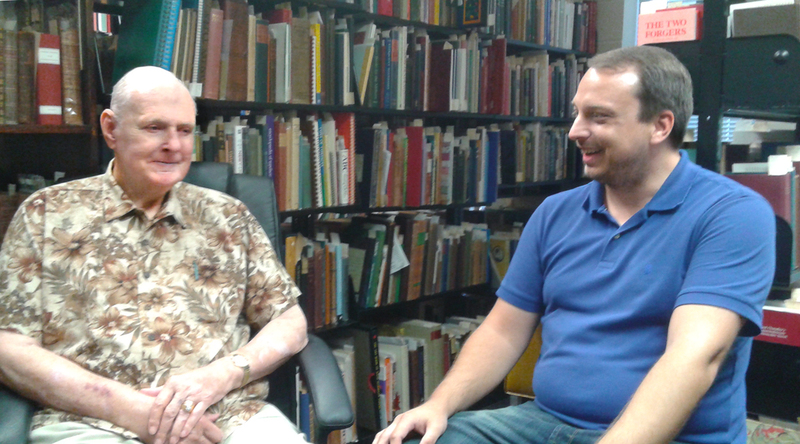 Lee Harrer talking with Sean Donnelly in the Tampa Book Arts Studio Library. Donnelly: Maybe that’s one thing that intrigued Hamilton about Hubbard: that he, too, was a kind of public relations man. And he attracted similar people to him, including Thomas Dreier. Did you ever meet Dreier? He was a contemporary of Hubbard with a slight connection to the Roycrofters, and he was one of the founders of the St. Petersburg Public Library. They have a room named for him. Mike Slicker (a St. Petersburg, Florida-based antiquarian bookseller) has examples of business magazines that Dreier edited, which look like Roycroft publications, but they were done for commercial companies and circulated internally to build identity and morale. So that is another local connection with the Roycrofters, somewhat indirect, but similar. Harrer: I’m sorry but I can’t put anything together with that name. Another early associate of Hubbard’s—who began as a Roycrofter but went on to greater fame—is Dard Hunter. His work is well represented in my collection, especially his research on papermaking. Donnelly: As part of an AAPA (American Amateur Press Association) convention I attended in Ohio several years ago, I visited Hunter’s home and studio, Mountain House, in Chillicothe. It hasn’t been changed much since he passed away, and the spirit of the Arts and Crafts movement feels very much alive in his printshop, where he made his landmark books on paper by hand. Mathews: Speaking of Dard Hunter, a piece of furniture that he made for the Roycrofters is featured in our 50th Anniversary issue of Tampa Review, in a section we are doing in partnership with the Two Red Roses Foundation. They are building the Museum of American Crafts in downtown St. Pete, with a large library, and their collection includes a significant Roycrofter presence. They have focused primarily on objects and artifacts, but we are aware that they have also developed strong holdings of Roycroft Press items. There are a number of ways that our collections relate to their collecting interests. Donnelly: They are going to be in downtown St. Petersburg, near the Mirror Lake Library. Mathews: It may be a good thing for Bibliophiles, because it will attract collectors of various kinds. Harrer: A big, large building. When is it due to open? Mathews: 2017. Their plans for the library itself seem to exemplify handcrafts, not only with the books and reference materials, but in all the decorations and furnishings of the room as well. was never a big thing, but something I enjoyed looking at, looking into. Mathews: Did other members of the Bibiophiles take an interest, after they heard the presentation by the Hamiltons? Harrer: I don’t think so. Mathews: Had you known about Hubbard growing up? Harrer: Only in a vague sort of way. I think the Elbert Hubbard Scrapbook was one of the first things I had in the way of Roycroft material. But it wasn’t until that funny box of things that I bought in Dunedin that expanded my awareness of it. I was selling real estate at the time, so not really a very bookish focus, but I had gotten involved in looking at a house—we did preview tours of houses at the time—and I noticed there seemed to be a lot of books for sale. I had started to buy books at that time, and I struck up a conversation with the owner of the house. I ended up buying quite a lot of his books. Again, I believe in the archives—either at home or here—are some letters related to the acquisition of this material. It would have his name—and he had been a primary collector of Roycroft material himself. 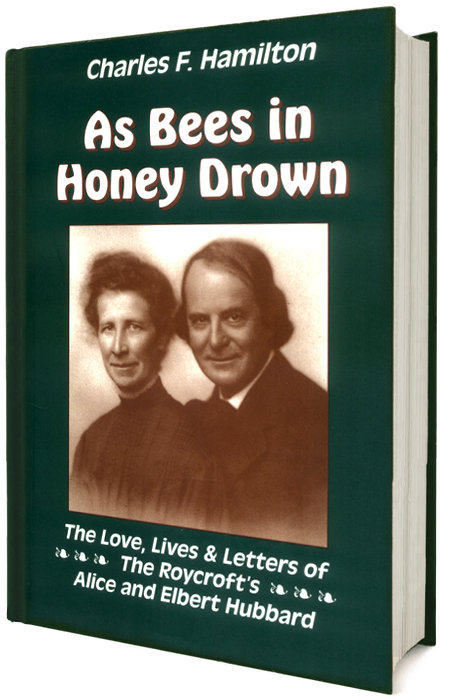 Mathews: As far as we know now we have Roycroft material in our collection from your original Dunedin purchase, then a few things from Hamilton—including this second edition of his book As Bees in Honey Drown, inscribed to you in 1997. It has some ephemera—and a nice photograph of Charlie Hamilton with Elbert Hubbard II. Harrer: Here is an article in the Antique Trader from 1981, and it has Charlie’s address and phone number. I suspect that I saw this, cut it out, and got in touch with him for the first time. 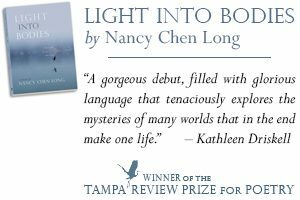 That is about the time that I contacted him, and met him, and talked to him about joining the Florida Bibliophile Society. 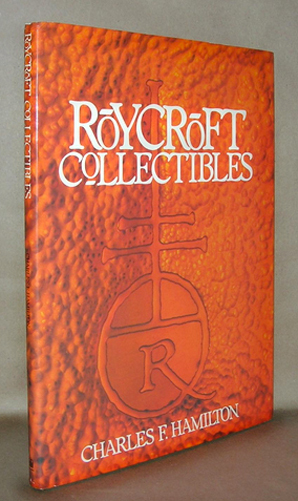 I had gotten the Roycroft material maybe about 1978, and I would have been looking to learn more about it and to assign some kind of value to it. Mathews: Were you intending to list the Roycrofter items for sale from the Midnight Bookman [Harrer’s book selling venture; see photo below)? Harrer: Yes. Usually I wrote a date inside them—and the date I acquired it. 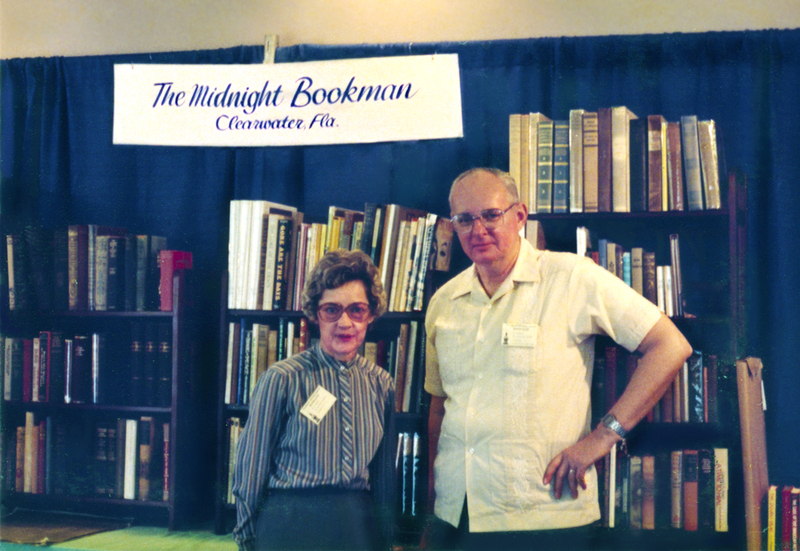 Lee Harrer with his wife, Rita, at the Midnight Bookman display at the Florida Antiquarian Book Fair in the early 1980s. Mathews: One of the things interesting about this particular publication is that this edition of “Message to Garcia” is being published by Hamilton in East Aurorora, because that means that the Hamiltons were based in that area and had some kind of a publishing operation in their background. Harrer: [He looks closely at the publication to study it.] This says it’s the 75th anniversary edition. I may have been given this by Charlie. It looks as if I didn’t buy it. . . . So here is Hubbard’s signature. And here is some of the Roycroft stationery that was given to me by Charlie Hamilton. The letterhead is printed on Fabriano paper made in 1900. The signature is authentic. 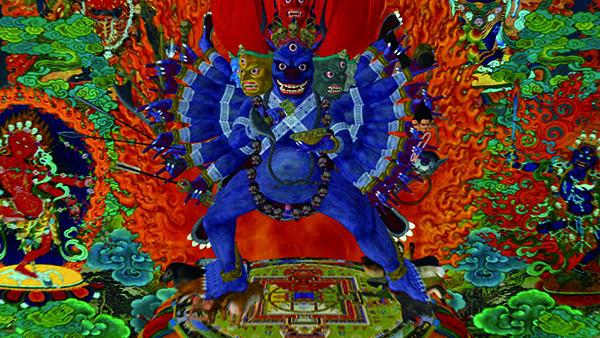 A Hubbard promotional piece. And Hubbard’s face is the watermark on these sheets. That’s not a bad rejection. But it makes you wonder. Had Hubbard really already written something “almost identical”? Do you suppose he could have taken advantage of ideas he received in the mail? That would add a different sense in his letter to the sentence when he says that he has read the manuscript “with pleasure and profit,” wouldn’t it? Mathews: Those are great items, Lee. I’m not sure how we could ever reproduce the watermark, but it is wonderful to be able to look at these more carefully. It is a wonderful occasion just to look through these items from the collection and appreciate them again.